Gary Thorberg and the MinnYaks Team will be exhibiting the world’s best fishing kayak at the 80th Annual Northwest Sportshow, March 28-April 1st, in Minneapolis Minnesota. Gary and the MinnYaks team expect anglers from Minnesota, the Midwest and Canada, to visit this show just to see the W fishing kayak. While considering what kind of fishing kayak to purchase to fulfill your personal requirements, it is of high importance to your wallet to be conscious of the fact that the bottom-line price of a fishing kayak is almost always not limited to just the base cost of the kayak itself. When you factor in the additional cost of the countless accessories necessary to outfit a traditional kayak, you will find that the money piles up and that the add-ons can end up doubling your investment. However, buying a Wavewalk fishing kayak eliminates much of these expenditures by eradicating the need for these hassling adjuncts. Kayak Rack: W kayaks are easy to cartop and fit any car rack – No need to go out of your way for auxiliary kayak rack. You save $50 – $500. Outriggers: The W500 kayak model is by far safer and more stable than traditional kayaks, even those equipped with outriggers. The W500 fishing kayak is so stable that their is zero need for outriggers, even with an attached electric trolling motor. You save $100 – $350. Rudders are a hassle to use, they considerably slow you down, and get easily mired in shallow water and weeds. Kayak seats are unhealthy for your back, and can turn a pleasant kayak fishing trip into an uncomfortable endeavor. It’s even possible that they will irritate you to the point that you quit kayak fishing in the long run, simply due to the mounting back pain and discomfort. When using a traditional SOT or sit in kayak, you must place a kayak rack on top of your car rack, taking up a lot of space and disallowing you from carrying other things you may need on top of your car. Outriggers, which are often necessary to establish adequate stability with the usage of a traditional kayak, are a pain to install, slow you down, and limit your kayak’s mobility and maneuverability. Out of the water, they’re just one more cumbersome thing to carry. The bottom line is that the slew of accessories needed to utilize a traditional kayak: rudders, yak racks and outriggers, are annoying, expensive, and unwieldy. The added cost of those accessories could top $1,000. Besides the financial investment, your health and peace of mind can be compromised by using these accessories in conjunction with a traditional yak. In order to avoid endless hassle, discomfort, and a gaping hole in your wallet, go to Wavewalk’s website to find these fishing kayaks. While this relaxed life appeases some retirees, for others it seems like their life is lacking some action – they want to do something extra that would add some more fun and excitement to their lives, and even bolster their income. 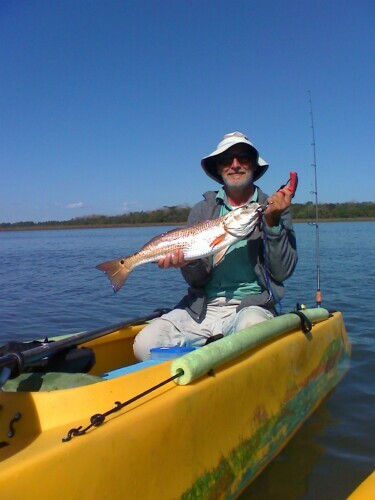 Gene Andrews, who retired several years ago, moved to Palm Coast, in Northeastern Florida, south of Jacksonville – the kayak fishing capital of the world, in order to pursue his passion of kayak fishing. Due to the ubiquitous yak-back problem that afflicts many older anglers, Gene bought himself a W500, the only back pain free kayak out there. Gene fished from it contentedly and free of back pain, and eventually realized he could further his love of the Wavewalk Kayak by starting his own dealership where he could resell this fishing kayak locally. Appending a crate to the rear of your fishing kayak’s cockpit has been standard procedure among kayak anglers for years. When you own a sit on top fishing kayak, attaching a crate rig is usually an unavoidable hassle in order to surmount the lack of available storage space. Because most sit on top fishing kayaks are very similar to paddle boards, storage is limited, and the cockpit room is very small. Sit in kayaks have slightly more space, but lack the amount necessary to make not using a crate a viable option. So far the only fishing kayak on the market that lacks the need for installation of external storage is called the W Fishing Kayak. The problems that arise from installing a crate on your kayak are numerous. Strong winds create heavy drag on protruding objects like crates, which is not ideal when you have to paddle back to shore after a long trip. Attaching a crate on a fishing kayak will make you more tired, quicker. Wind creates tracking problems for paddlers. Although the W fishing kayak has better tracking capabilities then typical sit on top and sit in fishing kayak, wind drag is still a problem to consider and its effects on navigation are serious. The W fishing kayak offers ample room in its spacious hulls, which are located in front of the angler, and are more easily accessed then a rear crate. This problem can be compared to that of whether to put your luggage int the farthest point of your car, or putting it where it is easily accessible, like the trunk or rear passengers seats. The W fishing kayak has about fourteen cubic feet of hull storage, much more than any sit in or sit on top fishing kayak could ever have, and probably more than a kayak angler will ever need. Storage crates also add the hindrance of increased weight in your fishing kayak. Weight is not a huge issue when paddling, but is a major problem when transporting your fishing kayak to and from your car to the launching point, (which is pretty much anywhere in the W fishing kayak). One may argue that it is not that much weight, but factor in your soreness and fatigue from just spending hours in the water fishing. Car topping your kayak with sore arms will make you hate every extra pound in your fishing kayak. Almost all sit on top and sit-in fishing kayaks have a deck that is below water level. If you are a salt water kayak angler you want your reels as far away from the corrosive effects of salt water, so you usually put tubular rod holders onto your fishing kayaks crate. These further you from your lines by about an extra foot, causing serious issues when attempting to fish. However, W fishing kayak’s hulls are higher than that of the average fishing kayak, creating the opportunity to store your rods away, safe from harm while launching, further decreasing the need for a mounted crate. W fishing kayaks have the option to be mounted with rod holders on the stern, that swivel in a large range, as well as place your fishing rods high above the water. By eliminating the need to augment your kayak with a crate, the W kayak saves you time, money, and the hassle of being perpetually weighed down by an unnecessary attachment like a crate.